Trains make it easy to go from Paris and Caen to medieval Bayeux. You could even make it a day-trip, though Bayeux has many good hotels. Bayeux, 32 km (20 miles) northwest of Caen (map), is accessible by train, bus and car. 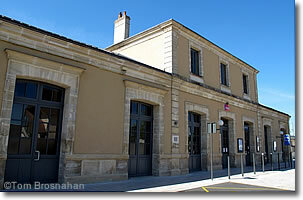 There are a few direct trains daily between Paris's Gare St-Lazare and Bayeux. For the rest, take a train from Paris to Caen, where you can transfer to another TER regional train for the short (15-20 minutes) ride to Bayeux. The entire trip between Paris and Bayeux takes 2 to 2.5 hours, depending on the train(s), making it possible to travel from Paris on a day-trip excursion to see this beautiful town and its famous Tapestry, with perhaps a quick trip to a few D-Day sites, but it's much better to stay at least one night. Bus Verts de Calvados operates the regional bus network in the Département de Calvados, which includes Bayeux. Ligne 30 is the line running between Caen and Bayeux. It takes about an hour for the Ligne 30 bus to cover the distance between Caen and Bayeux. There are four buses Monday through Friday from Bayeux to Caen, three buses Caen to Bayeux, none on weekends. N13/E46 is the highway between Caen, Bayeux and the Cotentin peninsula, with Cherbourg at its northern tip. Many of the D-Day sites can be reached via this highway, and one, the German War Cemetery, is right next to it. with trains to and from Paris's Gare St-Lazare.